Chances are you have at least one outdated cellphone sitting in a junk drawer. It’s estimated that about 30 million cellphones are sitting untouched in American homes. Instead of letting your old cellphone take up valuable space, consider recycling it. According to the U.S. Environmental Protection Agency recycling 1 million cell phones recovers 35,000 pounds of copper, 772 pounds of silver, 75 pounds of gold and 33 pounds of palladium. Recycling a cellphone is a bit more complicated than recycling a milk jug. You can’t just throw it into your recycling tub and expect the local recycling center to take it. However, there are plenty of options to dispose of your old electronics in an environmentally safe way. Most major cellphone carriers will buy back your old cell phone to recycle or refurbish the device. Some of these companies will give you a little cash for your phone right away while others may apply the amount in the form of a discount on your next bill. You’ll earn more for recent phone models that can be refurbished and sold again. But you can still earn a few bucks off of a cellphone that’s been collecting dust for a few years. Your cellphone may not be worth much, so you might consider donating the outdated technology to a charity that can stretch every dollar it earns from the device. There are plenty of organizations that operate off of the funds received through cellphone donations. Cell Phones for Soldiers, for example, uses recycled cellphones to purchase phone cards so soldiers overseas can affordably connect with their families. Hope Phones, a mobile medical unit based in developing countries, uses a cellphone recycling program to raise money for the equipment, supplies and personnel required to provide adequate healthcare in the world’s poorest regions. A third option is to take your old cellphone to the nearest recycling center that accepts electronics. You won’t earn any money by dropping off your old device, but you will at least save the environment from unnecessary waste. Many recycling centers will take your electronic equipment, including computers, TVs and cellphones, so you shouldn’t have to travel far to find one. If you’re not sure where to take it, Earth 911 has a great recycling center search tool that allows you to find the closest recycling center. 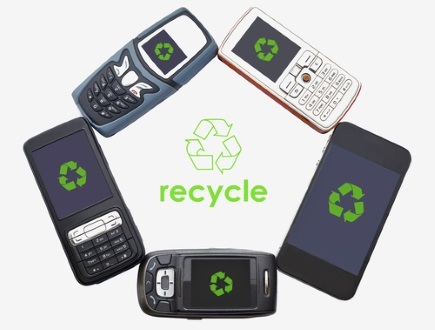 After you recycle your old phones, look for smarter ways to use your electronics and save energy!